One of the world's top compact cars since its inception, the BMW 3 Series masterfully combines both sport-oriented and luxury features to create a sleek cruiser with few peers. Some reviewers and owners find fault with the interior ergonomics of the 3 Series, and others note that optional add-ons can rapidly escalate the 3 Series' relatively affordable entry-level price, but when it comes to performance, handling, reliability, and the pure joy of driving, most owners find the 3 Series hard to beat. Now in its fifth generation, the 3 Series comes in a wide range of trims and body styles, including a new, sportier version of the 335i coupe and convertible, which joined the lineup for 2011. Beyond that, prospective buyers can choose from a total of 15 trims, at 328i, 335i, and 335is trim levels, in sedan, coupe, two-door convertible, and four-door wagon body styles, with rear-wheel or all-wheel drive. All 328i trims come equipped with a 230-hp, 3.0-liter six-cylinder engine, which posts fuel economy numbers of 18/28 mpg, although the numbers slip a bit for convertibles, wagons, and xDrive AWD-equipped trims. All 335i trims receive a turbocharged version of the 3.0-liter engine, which produces 300 hp and pushes the 3 Series from 0-60 in 4.7 seconds, while the 328is coupe and convertible are powered by a tweaked version of the turbocharged 3.0 six, which puts out an extra 20 hp for an exhilarating ride. Fuel economy numbers for the 300-hp six-cylinder check in at 17/28 mpg, while the 320-hp version manages a similar 17/26. Again, fuel economy numbers fluctuate a bit from trim to trim depending on such factors as the transmission, configuration, and body style. All powerplants run on premium fuel. The fuel economy and torque leader in the 3 Series lineup remains the diesel-powered 335d, which comes equipped with a 265-hp, 3.0-liter turbodiesel six-cylinder powerplant. It posts very respectable fuel economy numbers of 23/36 mpg, yet generates an impressive 425 lb-ft of torque, which results in insanely responsive acceleration. The BMW 3 Series routinely receives effusive compliments from owners and reviewers, who admire its sleek styling, balanced handling, solid engines, and top-of-the-class safety features. Some find the 3 Series' suspension too firm to be a comfortable daily commuter, especially for drivers who desire a softer ride, but owners who like to toss the vehicle a little while picking up the laundry or dashing out for groceries will find plenty to smile about. 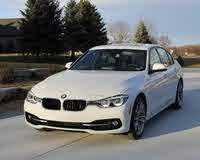 BMW plans to introduce a sixth-generation 3 Series for the 2012 model year. 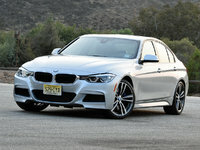 Early reports indicate the new 3 Series will sit on a longer wheelbase than the current generation (by about 1.5 inches), and will likely offer an eight-speed automatic transmission on certain trims, as well as a number of optional features currently available for the BMW 5 Series and 7 Series vehicles, including a lane-departure warning system and radar-based cruise control. It's also possible we'll see a hybrid version of the 3 Series in the next generation. During the 1970s, BMW began the process of modernizing its lineup of vehicles. 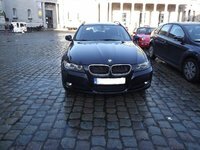 In the early years of the decade, the German automaker launched a new line of midsize cars dubbed the 5 Series, so named because they were the fifth of a "new series" of vehicles designed by BMW. When the time came in the mid-'70s to replace the popular 2002 compact sedans, BMW followed suit by calling its new line the 3 Series. When the full-size 7 Series debuted a few years later, the automaker had succeeded in creating a new lineup of sport-oriented luxury cars that continues to this day. The first generation of the 3 Series made its worldwide debut at the Munich Olympic Stadium in 1975. It displayed styling cues borrowed from its big brother, the 5 Series, including a slanted dual kidney grille with round headlights, a narrow domed ridge along the flat hood, and low sidelines. Internally known as the E21, the new 3 Series sat on a 100.9-inch wheelbase, with an overall length of 171.5 inches, making it slightly longer than the 2002 model it replaced. 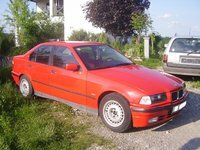 When the 3 Series made its U.S. debut a couple of years later, in 1977, it came only in a single two-door trim, the 320i, although additional trims (the 316 and 318) were available in Europe. 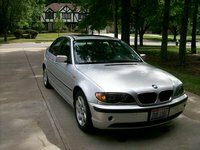 The 320i came equipped with a 110-hp, 2.0-liter fuel-injected four-cylinder powerplant paired with a four-speed Getrag manual transmission or an optional three-speed automatic. Outside, the 320i displayed a number of features designed solely for the U.S. market, including larger bumpers and unique headlights. Under its skin, the 3 Series featured a new suspension with MacPherson struts in the front, rack-and-pinion steering, and front disc brakes. Inside, BMW angled the center console toward the driver, creating an interior theme that would exist for decades. Rounded edges and padded surfaces helped ensure passenger safety. Although BMW introduced two new 3 Series trims in Europe in 1977, both powered by new six-cylinder engines, the automaker made few changes to the U.S. version of the 3 Series until 1980, when it swapped out the 2.0-liter powerplant with a new 1.8-liter engine, dropping horsepower to 100. 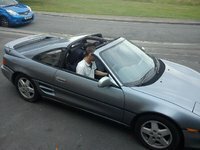 However, when mated to a new five-speed manual, the engine still delivered peppy performance. 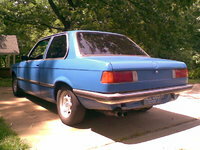 The second-generation 3 Series, dubbed the E20 internally, launched in 1980, and would remain in production for more than a decade. Again, for the U.S. market the 3 Series came only in a single trim initially. The two-door 318i was powered by a 1.8-liter four-cylinder engine producing 101 hp. Two six-cylinder trims were also available in Europe. Outside, changes were evolutionary rather than revolutionary. The dual-kidney grille with round headlights remained, although its slant was less dramatic, and the overall lines were more aerodynamic. The wheelbase grew only minimally, to 101.2 inches, while overall length decreased slightly. However, due to a retuned suspension and a tighter frame, handling improved dramatically, according to some reviewers. 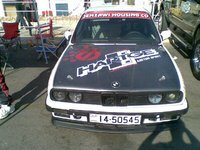 Following in the footsteps of the 318i was the 325e, sometimes referred to as the "eta" (for the Greek letter e, which was used by BMW to indicate efficiency or economy). Powered by a 121-hp, 2.7-liter inline six-cylinder, the 325e represented the most powerful 3 Series trim offered so far in the U.S. 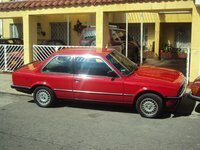 In 1985, BMW introduced the 3 Series in a four-door body style, with either the four- or six-cylinder powerplant. 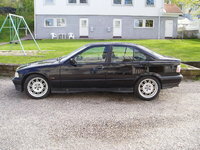 By 1986, the 318i had disappeared from the lineup. 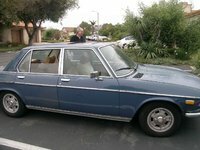 While the 325i and 325is were introduced in Europe in 1985, they didn't make it to U.S. shores until 1987, replacing the 325e. Power came from a 2.5-liter six-cylinder engine, with a shorter stroke and higher revs than the 325e, pushing horsepower to 168. The 325is added an "is" package, which included a close-ratio transmission, a black roof liner, and 14-inch BBS Basketweave wheels. It also was available with a number of optional features, including a sport steering wheel, sport seats, leather upholstery, and a sunroof. The 325iC convertible also joined the lineup in '87. 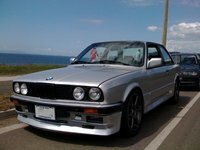 For 1988, BMW introduced the first M3 to the U.S. market. Power came from a twin-cam, 2.3-liter four-cylinder engine generating 192 hp. The two-door sport coupe sat on a sport-tuned suspension and displayed such exterior features as flared fenders, a repositioned rear window, and higher rear deck. 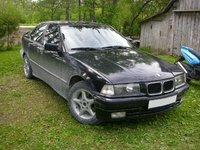 When the third-generation 3 Series (called the E36) debuted in mid-1991 for the 1992 model year, it represented a clear break with the past, and set the standard for all 3 Series vehicles that would follow, due in part to its size. The new 3 Series sat on a 106.3-inch wheelbase, an increase of 5.1 inches over the previous generation, while overall length measured 4.3 inches longer, resulting in more interior space. The exterior design, which some referred to as a "dolphin" shape, featured smoothed, more aerodynamic lines and the signature dual-kidney grille with round headlights. Power for the third generation came from a wide range of engines, including a new 189-hp, 2.5-liter six-cylinder for the 325i. A driver's-side airbag became standard equipment, along with antilock brakes and rack-and-pinion steering. During the third-generation transition, certain body styles rolled out more slowly than others. 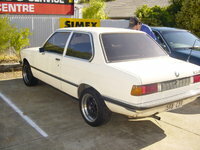 In its first year, the new-generation features were extended only to the sedan, while the third-generation coupe rolled out a year later with a unique exterior design, including a more steeply sloped front windshield and a new rear end. The third-generation 3 Series convertibles would not appear in U.S. showrooms until 1996. In addition, a 318ti hatchback debuted in 1995. It also featured a unique rear end, though its front end matched the sedan's. Also in 1995, a new version of the M3 hit the streets. Power for the sport-oriented two-door coupe came from a 3.0-liter six-cylinder engine producing 240 hp and 225 lb-ft of torque. The powerplant drove the M3 to 60 mph in just 5.6 seconds. A number of M3 variations appeared through the late 1990s, including the M3 Lightweight in 1995 and the M3 Evolution in '96. A four-door version of the M3 appeared in 1997. 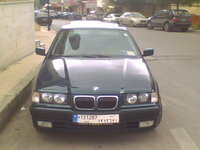 The fourth-generation 3 Series (called the E46) similarly trickled into showrooms, with the 323i and 328i sedans appearing in 1999, and the coupes and a new 323i wagon trim showing up a year later. The engines were upgraded in 2000 as well. 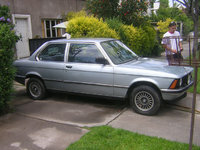 The 323i received a 170-hp, 2.5-liter six-cylinder, while the 328i came equipped with a 193-hp, 2.8-liter six-cylinder. A fourth-generation 323Ci wagon debuted in 2001. 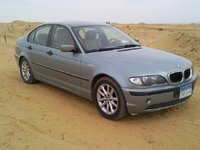 Also in 2001, BMW's xDrive all-wheel-drive system was offered as an option for the first time. In addition, BMW introduced two new, heftier powerplants in 2001, leading to a trim update. A new 3.0-liter powerplant replaced the 2.8-liter six-cylinder, prompting BMW to change the nomenclature of the 328 to the 330, while the 323i's six-cylinder powerplant received a boost in horsepower to 184. The wheelbase for the fourth-generation 3 Series was stretched again, to 107.3 inches, while overall length checked in at 176 inches. Exterior design features included an evolutionary version of the dual-kidney grille, as well as larger wheel arches and an arched roofline. A new M3 appeared in 2002. It came in coupe and convertible body styles, with a reshaped "power dome" hood and sport-oriented M-style bumpers, side skirts, and mirrors, as well as a rear spoiler. BMW also outfitted its the interior with unique M-badged components, including a sport steering wheel, sport seats, and a revised instrument cluster. Power came from a tweaked 3.2-liter six-cylinder engine, which put out an impressive 333 hp and 262 lb-ft of torque. Driven by its powerful engine, the M3 jumped out from 0-60 in just about 5 seconds. The M3 sat on a performance-tuned suspension and 18-inch alloy wheels. The fifth-generation 3 Series (E90 for the sedans, E91 for the wagons, E92 for the coupes, and E93 for the convertibles) again appeared in stages. New sedans and wagons debuted in 2005 for the 2006 model year, while the coupes and convertibles appeared a year later. This was due to the fact that the sedans and wagons shared a similar, wider body style, while the coupes and convertibles were longer and narrower. As a result, the coupes/convertibles sat four passengers, as opposed to five-passenger seating for the sedans and wagons. Wheelbase for the fifth-generation trims was stretched by 1.4 inches, to 108.7 inches, while width for the sedans and wagons was increased by 1.2 inches. Overall length varied from 178.2 inches for the sedans/wagons to 180.6 inches for the convertibles and 181.9 inches for the coupes. In 2008, BMW rolled out a fifth-generation M3, powered by a 414-hp, 4.0-liter V8 generating 295 lb-ft of torque. The V8 drove the M3 from 0-60 in 4.3 seconds. Mid-generation refreshes occurred for the sedan and wagon in 2009, and for the convertible and coupe in 2011. 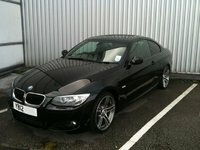 Prospective buyers will find plenty of 3 Series vehicles available, going all the way back to the first generation, some of which are still on the road. However, buyers will face premium prices for many later-model trims, since the 3 Series regularly makes the lists of cars with the best resale value, and Kelly Blue book named BMW as the overall brand leader when it comes to the resale value of all of its models. However, given the wide range of trims and body styles available, especially in recent years, buyers will have plenty of options to sort through to find the one that best suits their needs and budgets. With a sixth-generation 3 Series on the horizon, buyers may find good deals on fifth-generation 3 Series trims. Sedans and wagons in particular feature exterior designs dating back to 2006, so some owners and dealers might be willing to part with those trims to clear the way for the sixth generation when it arrives in 2012. Other fifth-generation trims, including coupes, convertibles, and the M3, feature newer styling and updated features, so they may still come at a premium price. The fourth-generation 3 Series trims also make good options for buyers, since many features, such as the xDrive AWD system and DVD navigation, were introduced during that time period. 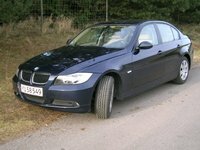 In addition, BMW introduced two new engines in 2001, which provided good performance. The fourth-generation M3 in particular, which debuted in 2002, should be on the radar of any buyer who seeks a performance-oriented ride. The third generation was the first to feature a staggered roll-out of trims. The coupes debuted a year after the sedans, while convertibles didn't appear until 1996, so prospective buyers should be sure to check features and exterior styling of any 3 Series trim to determine its generation. 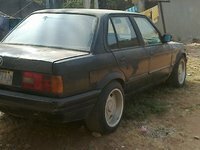 In addition, the 318ti hatchback appeared with the third generation, adding a level of functionality to the typical 3 Series vehicle. 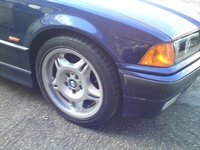 Older 3 Series trims, such as the 320i, the 318i, and the 325e, might make good options for buyers who seek the BMW mystique at an affordable price. 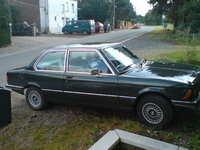 The second-generation vehicles in particular, which debuted in 1980, were praised for their tight feel and nimble handling and are testaments to the build quality of the 3 Series throughout the years. 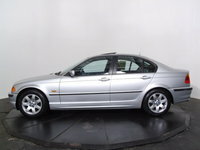 Start a new BMW 3 Series question.